Regardless of your profession, proofreading is an important skill to know. A round of revisions will help you express yourself more clearly and eloquently, and penning a perfectly punctuated letter is an underrated art form. Proofreading marks will help you edit more efficiently, but navigating all those squiggles and dots can feel like learning a foreign language. 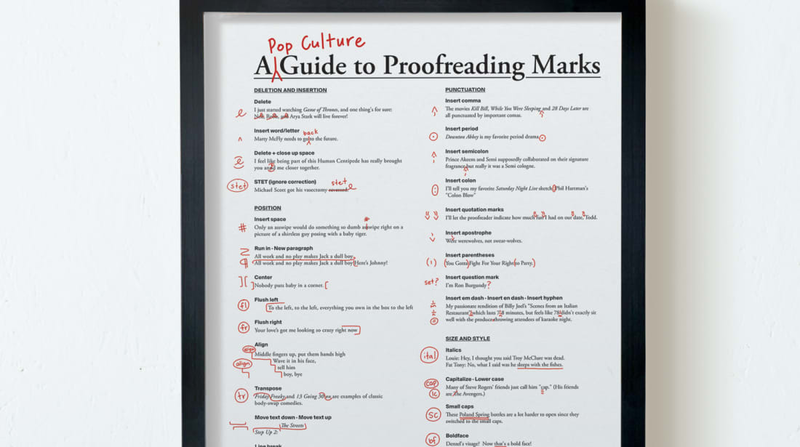 Here to help is Pop Chart Labs, which used pop culture references to create a fun guide to proofreading marks. As for the Oxford comma—whose use is hotly debated among punctuation purists—the chart makers rule in favor of it. “The movies Kill Bill, While You Were Sleeping, and 28 Days Later are all punctuated by important comas,” the comma section of the poster reads. “I’m Ron Burgundy?” (an Anchorman reference) falls under the question mark category, and “Nobody puts baby in a corner” (Dirty Dancing) is given as an example of text centering. “Let Beyonce teach you about flushing left (to the left), Italian stereotypes from The Simpsons illustrate ital-ics, Michael Scott portray the pain of having your edits and/or vasectomies reversed, and all too many Game of Thrones characters demonstrate deletion (warning: SPOILERS),” Pop Chart Lab writes in its description of the poster. With this chart on your wall, you’ll never miss the mark. The 18-inch-by-24-inch poster costs $30 and is currently available on Pop Chart Lab's website.